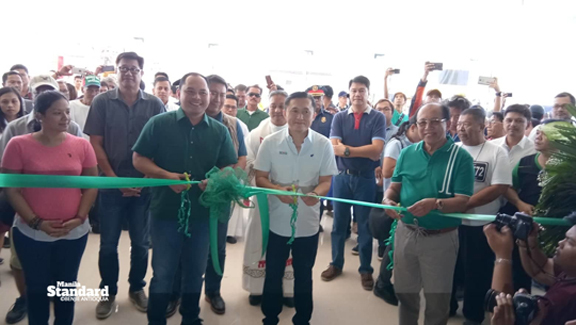 Former Special Assistant to the President Christopher ‘Bong’ Go (center) leads the ribbon cutting for the blessing and inauguration of the Southern Quezon Convention Center in Barangay Tabing Dagat, Gumaca, Quezon on Thursday. Flanking Go are House Minority Floor Leader and Quezon 3rd District Rep. Danilo E. Suarez (right), and Quezon Governor David C. Suarez (left). Also in photo and at the event are Party-list Rep. Anna Suarez, Gumaca Mayor Erwin P. Caralian, Provincial Administrator Rommel Edano, Capitol executives Diony Rodolfa, Bong Diaz, Matt Florido, and Webster Letargo, and Provincial Board members.